Toque Flamenco is born early in 2014 after two greatly talented musicians and one passionate dancer who have been doing Flamenco for years on their own meet each other with a shared vision. What happened next was the perfect blending of each other’s talents, tons of inspiration, dedication and creativity, which altogether creates astounding shows every single time. The second dancer, Karito Espí, joins Toque Flamenco late in 2015 creating an even more unique show. Each of the band members has a long record of music/dance training and over 15 years of performance experience. Mario who is originally from Mexico, grew up surrounded by a family of musicians and listening to all kinds of music including Flamenco. He starts playing guitar, piano and percussion while still being a kid and he begins performing professionally at the young age of 19. 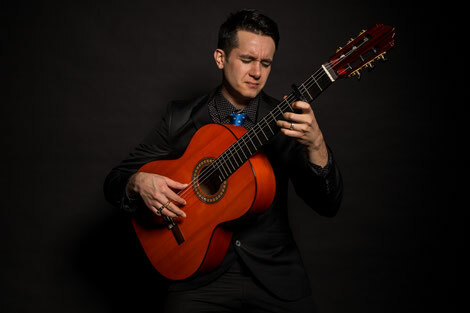 After developing a successful career in Puebla, Mexico as a soloist singer and guitarist, he moves to the city of Vancouver where he decides to focus on Flamenco music, particularly in singing, percussion (cajón) and flamenco guitar. In a few years Mario has become one of the main artists in Vancouver music scene, collaborating with other musicians such as Tambura Rasa, Mariachi ‘Los Dorados’ and Oriana White and performing in major venues and events around Greater Vancouver, Victoria and Toronto. During his years in Mexico and his time in Seville and Jerez (Spain) he has perfected his flamenco skills with amazing flamencos such as: "El Oruco", "El Tequila de Jerez", José Barrul, Paco "Gasolina" chico, "La Boterita", Lucas Ortega, Juan Moneo, "El Carbonero" and Ramón Martinez to name a few. Mario is also a music teacher and can be found performing regularly at Kino Café (Vancouver) with his flamenco band "Toque Flamenco" and his duet TAPAITO with Marilú Vallejo. Marilú was born in a family of Spanish origin and grew up listening to Spanish music and flamenco. She started her professional flamenco training at the very young age of 10. Everyone in her family calls her 'Peque' or 'Pequeña' thus her stage name 'La Peque'. Marilú has performed in the main stages of Acapulco, Mexico City and now Vancouver. During her time in Mexico city and Andalucía, she has trained with some of the best flamenco dancers including: 'La Lupi', Juana Amaya, Mercedes Ruiz, 'El Oruco', María Bermudez, Soledad Barrio, Fiona Malena, Manuela Ríos, Cristina Benítez and many others. Marilú has collaborated with great Vancouver artists such as pianist Oriana White and the world music band Tambura Rasa to create unique shows. She performs regularly at Kino Café (Vancouver) as a soloist with her band "Toque Flamenco" and with her duet "TAPAITO" with Mario Sota. Dancing since the age of four, Carolina Vallejo “Carito” has a very rich and diverse background in dance that ranges from dancing Jazz to performing flamenco solo pieces. A member of Toque Flamenco, Carito is currently performing flamenco throughout BC, Canada. Carito has been passionate about dance from a young age taking ballet at the age of four and continuing for several years until she developed a strong dancer profile. At the start, Carito only focused on Jazz, Tap and Spanish dance and it was not until she was a teenager that she discovered her great love and passion for Flamenco when she began taking Flamenco with professors Martin Cruz and Soledad Fuentes. Carito has had the privilege of studying Flamenco under Concha Jareño, Fiona Malena, Cristina Benitez, & Fanny Ara tutelage. Some of Carito’s other notable experiences include performing in flamenco productions at the Vancouver Playhouse, Coffee Concert Series Port Coquitlam, and Chilliwack Cultural Centre, where she always had one of the main roles in productions such as Snow Queen (2013), Swan Lake (2014), West Side Story (2014), Alice in Wonderland (2015), Carmen (2015), and Snow White (2016). In addition, she has performed in several festivals and venues throughout BC including PNE, Diwali Festival, Richmond World Festival, International Dance Day Richmond, Vancouver Chinatown Festival & River Rock Casino. She has also performed in collaboration with the world music band Tambura Rasa.